We are being lied to every day, by not only the corporations that are polluting and destroying the very eco-systems upon which we rely for our survival, but by the governments we have elected who spend their time and energies protecting them. Here in Canada we have the tarsands with their attendant tailings ponds which are a massive ecological disaster, an inefficient way to get oil from the ground, and late last night it was reported that deformed fish are being found in Lake Athabasca downstream from the tarsands in northern Alberta. From the Reuters article: The fish are hard to look at. One whitefish has a golfball-sized tumour bulging from its side. Another is simply missing part of its spine, its tail growing from a stumpy rear end. One has no snout. Another is coloured a lurid red instead of a healthy cream. Others are covered with lesions and still others are bent and crooked from deformed vertebrae. As sad as that description is that's not the kicker to this news piece. That's reserved for Canada's Federal Environment Minister Jim Prentice who says his department is testing out a new "fingerprinting" machine that can help determine if substances are naturally occurring or are from the tarsands. Naturally occurring? The mind reels at the thought of this moron suggesting that somehow these poor deformed animals are a byproduct of something happening "naturally!" But then his job is to protect the oil giants. 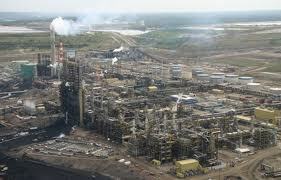 Screw the residents, screw Canadians, screw everyone except the oil giants. They are the country's most important citizens, right? 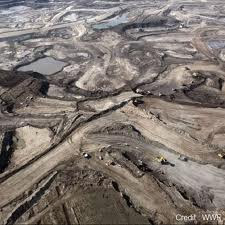 Well to educate the uninformed Minister of the Environment Jim Prentice, maybe he's unawares of a recent study that linked tarsands mining and toxins found in the Athabasca River. I should point out that the findings counter reports by a joint industry-government panel that the pollutant levels are due to natural sources rather than human development. The study led by Erin Kelly and David Schindler of the University of Alberta also found that levels of the pollutants cadmium, copper, lead, mercury, nickel, silver and zinc exceeded federal and provincial guidelines for the protection of aquatic life in melted snow or water collected near or downstream from oilsands mining. Wait, there's more. It also turns out that when it comes time to pay for the cleanup there's a good chance Alberta taxpayers will foot the bill: (from the Globe and Mail) The industry has a total of about $820 million in such guarantees for remediation. That’s supposed to cover about 69,000 hectares of disturbed land, averaging about $12,000 a hectare. But based on costs already incurred by some remediation projects, true cleanup costs are much higher, the report says. The institute estimates it could cost at least $220,000 a hectare and perhaps as high as $320,000 a hectare.